Can we give up things which we are used to for a very long time? Can we give up things which we are used to for a very long time? nammAzhwAr says when we understand their defects such as impermanence, etc., they can be easily given up. Subsequently, to facilitate the process of renunciation (giving up), nammAzhwAr identifies the impermanent nature of the aspects that are to be given up. In the first pAsuram, nammAzhwAr instructs everyone to give up all aspects other than bhagavath vishayam and surrender unto emperumAn. When some one questions “You are asking us to give up worldly attachments. But we have been used to it since time immemorial. How we can we give them up now?”. nammAzhwAr replies through this pAsuram “when you understand the defects of the worldly aspects, they can be given up”. jIvAthmA accepts many bodies (birth after birth) that are likeable by him. But these bodies are so impermanent that they are not even having the permanent nature of a lightning which appears and disappears in a flash. Seeing this, you meditate upon the supreme lord who is the master. AzhwAr says when one analyses and understands the impermanent nature of the body, etc., which are related to the jIvAthmA, then those impermanent aspects can be easily given up. Also, for the singular usage of uyir (jIvAthmA – soul) and plural usage of AkkaigaL (sarIram – bodies), periyavAchchAn piLLai quotes bhagavath gIthA 2.22 “vAsAmsi jIrNAni” slOkam, where emperumAn explains that as a person acquires new clothes when the old ones are unusable, the AthmA will acquire a new body when the old one becomes unusable (at the time of death). So, the same AthmA, continually acquires a new body birth after birth. 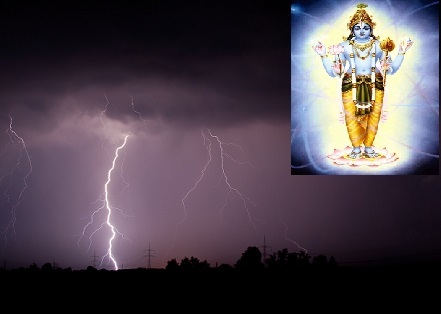 minnin nilaiyila – In the case of lightning, we atleast know that it exists only for a moment. It is both insignificant and impermanent. But, the body, even though is impermanent, it creates an illusion in the mind that it is permanent and leads to all kinds of troubles. Just like when some one places their hand on a snake thinking that it resembles sandalwood paste which has beautiful fragrance, coolness, softness, etc., and if he is informed that he is keeping his hand on a snake, he cannot resist taking his hand away (seeing the danger). Similarly, when the real defects of this temporary body (and material realm) such as insignificance and impermanence are highlighted, one can easily give it up. mannuyir AkkaigaL – the bodies in which the AthmA is well seated; it is also explained as the different bodies pursued by the eternal jIvAthmA. nampiLLai gives a beautiful example – “thiRanthu kidantha vAsalgaL thORum nuzhainthu thiriyum padhArththam pOlEyiRE ivan thirivathu” (Just like a dog that will enter into any house that has an open door and come out, AthmA enters so many bodies through the cycle of birth and death). Here, the usage of singular AthmA is considered as an example for all AthmAs that pursues many bodies. ennum idaththu – the defects are so much – even more than bhagavAn‘s auspicious qualities. nIrE – you can understand it just by observing yourself (since the impermanence is quite obvious). There is no need for pramANam (sAsthram, etc) or AchArya upadhEsam (instructions from an AchArya) to understand this. This entry was posted in thiruvAimozhi, thiruvAimozhi 1st centum on May 12, 2015 by Sarathy Thothathri.